Based in Berlin, German artist Bettina Pousttchi is known for her work in sculpture and photography, teasing out the politics of perception, particularly as it emerges through institutionalized structures—whether the exterior of a building, or the dial of a clock. 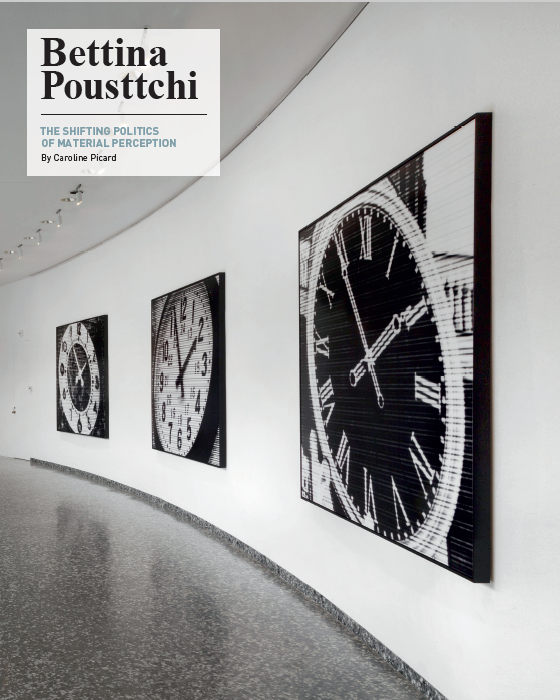 Most recently, Pousttchi was featured in two concurrent, though independent, exhibitions on view in Washington, D.C.— the first, World Time Clock at the Hirshhorn Museum and Sculpture Garden, and the second, Double Monument for Flavin and Tatlin (2010–2014) at The Phillips Collection. Pousttchi draws our attention to the often invisible architectures that furnish and shape individual life—whether by capturing various international clocks at the same moment, or combining neon lights with the contorted guard rails used to organize crowds in public space. In the following conversation, Pousttchi discusses the ways in which the physical world is also a highly mediated experienced. This May, Pousttchi’s work came to Chicago as part of a solo installation and newly created site-specific work, Suspended Mies, at The Arts Club of Chicago. Caroline Picard: How did you find the clocks featured in your World Time Clock photographs? Bettina Pousttchi: World Time Clock is a project I began in 2008—over the course of eight years, I traveled throughout the globe, photographing public clocks in different time zones, but always at the same time: 1:55pm. My travels were very focused; I did not stay in most places for more than two or three days. I researched the clocks before my travels, mostly by online sources and also— more importantly—on location. In some places, it was easy to find public clocks that were still working, in other places it was nearly impossible. CP: Did you find a correlation between the working condition of the public clocks and the condition of the city in which they resided? I am thinking about certain especially modern cities that might only have had digital clocks—would you have been interested in those? BP: No—the project focused on analogue public clocks. It was surprising how different cities are when it comes to the existence and the maintenance of these timekeepers. In some cities, there are many that are broken, or showing the wrong time, while in others they all seem to be working. During my travels, I have noticed that there is a relation between the clock faces and the colonial history of the place. The cities which once belonged to the British Empire, for example, have more clocks than others, and some of their faces resemble Big Ben. CP: I read an anecdote about how you occasionally arrived in a city, only to find the boundaries of that country’s timezone had been changed. The story made me interested in time as a regime, how we must agree to observe time consistently as a society in order to facilitate our interactions. Like language, the clock is a fundamental structure. For me, World Time Clock amplifies the slippery and political nature of time. BP: Yes—timezones were introduced in the late nineteenth century as a response to humanity’s increased mobility. The system as we have it today has not changed much since then—though, during the course of my project, some countries have changed their time zones, such as Russia and Chile. Russia went from eleven time zones to nine in 2010, and then back to eleven zones in 2014. I had to adjust my project after every change. CP: Did your physical experience of the individual works change once you they were installed in the rotunda space of The Hirshhorn? In walking around the exhibition, one could say it is almost as if the viewer experiences time standing still, since each of the photographed clocks capture the same moment. BP: Although World Time Clock was not commissioned by the Hirshhorn Museum and Sculpture Garden, its current presentation there almost looks as if it was made for the space. The museum’s third floor ambulatory gives a great architectural setting for the work. The series of twenty-four photographs are experienced in a 360-degree loop, with no chronological or geographical order. The spectator moves from Mumbai to Los Angeles to Seoul to Moscow. CP: Unlike Christian Marclay’s film, The Clock (2013), where one sees a series of clocks moving via found footage, the duration of your project is both tremendous in its source of impact—i.e. collecting time stamps over such a long period—and at the same time resists being directly accessible. 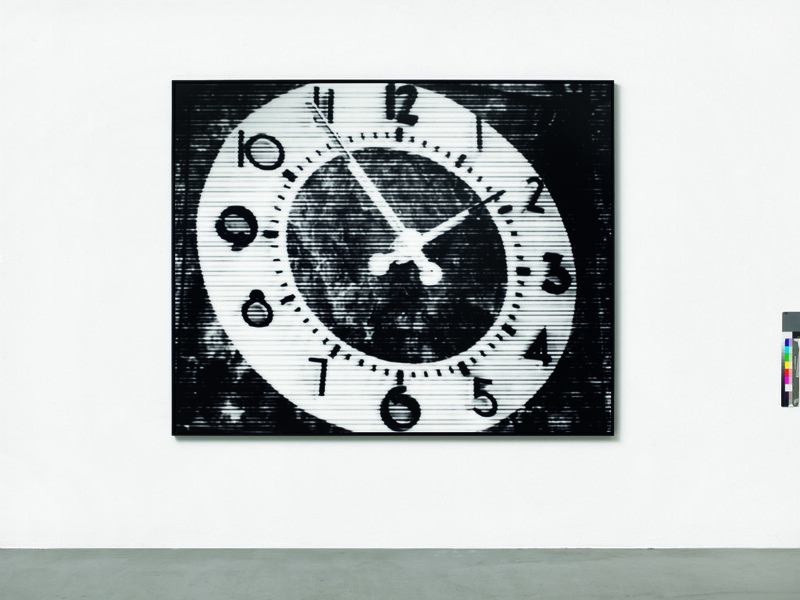 BP: Yes—that difference is correct; World Time Clock is a photographic project, using the specifics of the photographic medium to suggest a moment of global simultaneity, whereas Marclay’s film shows the relationship of the moving image and its history in comparison to real time. 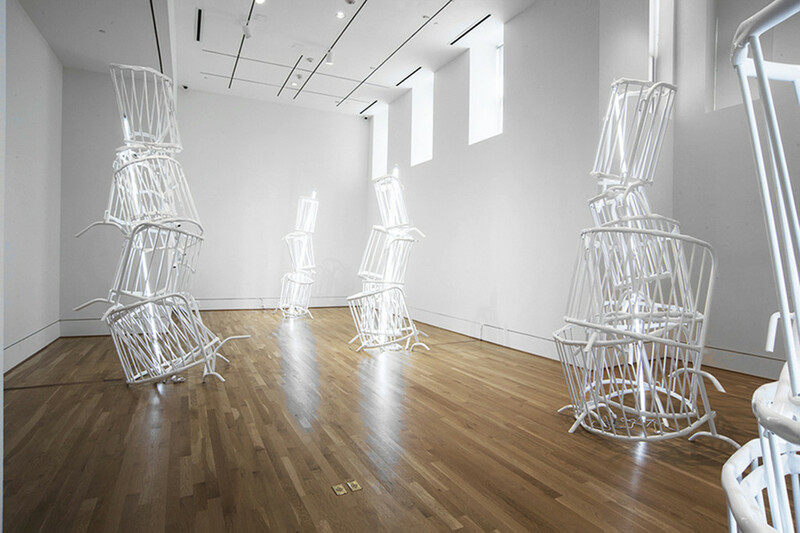 CP: You have a second show on view at The Phillips Collection, Double Monument for Flavin and Tatlin (2010–2014), which includes five sculptures in one room, and an exhibition of artworks from the permanent collection that you curated in another. Bettina Pousttchi, Parachutes 01, 2006. Photograph. 120 x 160 cm / 47¼ x 63 in. Courtesy the artist and Buchmann Galerie. BP: Double Monument for Flavin and Tatlin is a sculpture series that is made out of crowd barriers and fluorescent light tubes. They refer to Vladimir Tatlin’s concept for a tower for the Third International. This unrealized architectural structure was often quoted by following generations, including Dan Flavin with his light sculptures “monuments to V.Tatlin.” I followed this historic trajectory with a double homage, paying tribute to both of them. CP: How did you see the role of ‘street furniture,’ the guard rails themselves, within this context? BP: I have very often used street furniture in my sculptural works—such as crowd barriers and street bollards—as they are objects that occupy public space, and structure the way we move through it. I am interested in the relationship between those objects to the body and its movements in space. 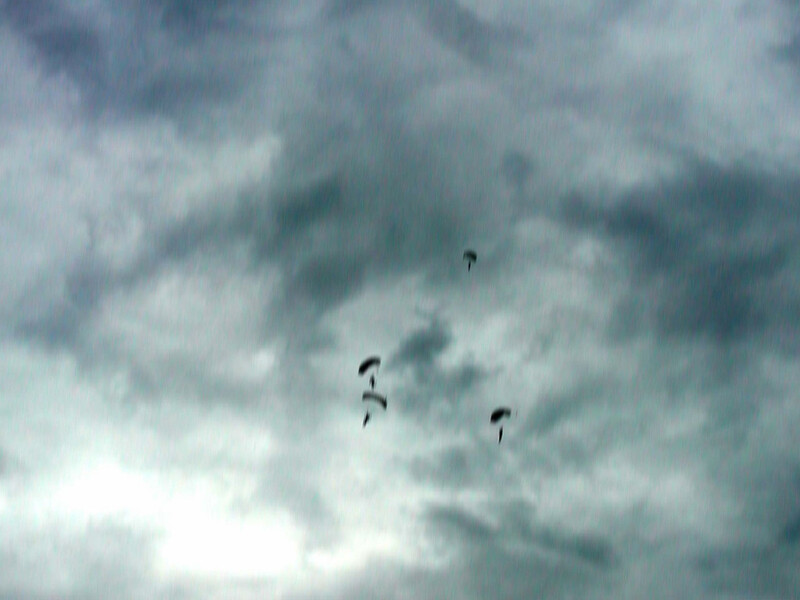 CP: Your photo series, Parachutes (2007) features lush, dramatic clouds interrupted by the blurred figures of helicopters or fighter planes. Because many of these aircraft were designed for war, the photo reminds me of how conceptions of nature, or the heavens, serve a political ideology that we may not always be aware of. Is this question something that interests you? BP: I am interested in the man-made organization of nature. How did we decide to structure the abstract notion of time? How do we organize the space surrounding us? Our systems of time and space are not neutral; they have political implications. We bring our own concepts and ideologies to it. With new technologies arising, our relationship to nature is changing, as well as the role of the human being within it. Bettina Pousttchi, Los Angeles, 2012. Photograph. 180 x 225 cm / 70¾ x 88½ in. Courtesy the artist and Buchmann Galerie. CP: For Echo (2009–10) you dressed the former Temporäre Kunsthalle in Berlin with black and white photos of the building that used to be on the same site, the Palast der Republik (Palace of the Republic). The site is rich with layers of history—originally the site of a Prussian Palace, it suffered extensive damage during the war and was subsequently replaced by the GDR’s governing headquarters and cultural center. After that building was destroyed in the early 2000s, a temporary art space was erected on the same site. 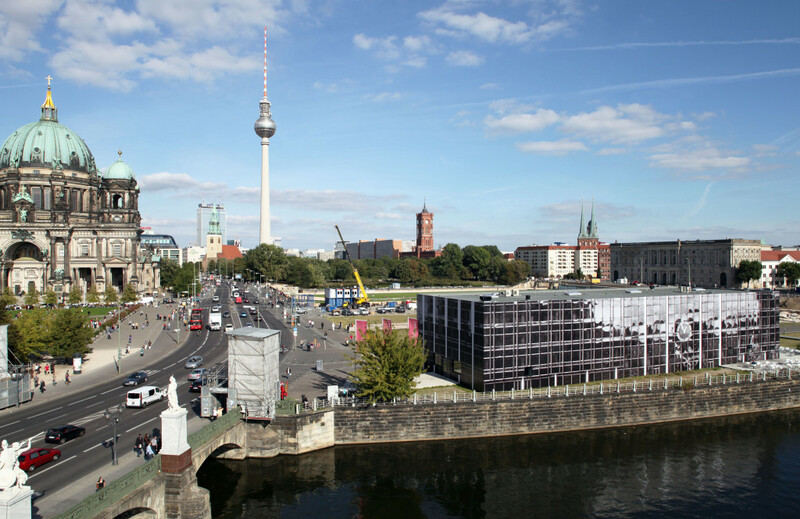 What made you interested in erecting a three-dimensional reproduction of the former GDR headquarters on this site? BP: Echo was a photo installation in public space that I realized on Berlin’s Schlossplatz—for the duration of six months, I covered the facade of Temporäre Kunsthalle Berlin on all four elevations with 970 paper posters. Together, the black-and-white prints formed one motif that recalled the Palace of the Republic, a building that had just been demolished on that very site after several years of political debate. No matter what your opinion was on destroying the former parliament building of the GDR, seeing this huge volume in the heart of Berlin disappearing was a strange experience. It unavoidably created a feeling of loss. In response to that experience I conceived Echo as an afterimage of the building that was just gone. CP: This site of Berlin seems to epitomize the relationship between political regimes, history, popular opinion, and architecture. Especially as construction is currently underway to rebuild a new iteration of the former Prussian Palace. BP: On Berlin’s Schlossplatz, there are many layers of German history. Over the past centuries, and especially in the past few decades, there has been a constant writing and overwriting of history and its physical manifestations in architecture. The City Castle that had been standing there for a long time was destroyed in World War II. After the war, it remained a ruin until the new state of the GDR decided to demolish it and build their new parliament building on that site, the Palace of the Republic. Installation view Bettina Pousttchi: Double Monuments. The Phillips Collection, Washington DC, 2016. Courtesy the artist and Buchmann Galerie. After the fall of the Wall, the Palace lost its initial function and was re-used as a cultural venue for about fifteen years. After a long political debate, it was then decided to tear this building down and to reconstruct the pre-war Prussian City Castle. That construction is currently on the way. The new building will host the “Humboldt- Forum,” bringing together several ethnographic collections of World Cultures in a new museum. Echo was referring to that urban transformation. CP: This is also why I love that Echo was not to scale, and that your installation was a black and white constellation of images that skinned a building…even if there were viewers who were convinced by the illusion of Echo’s exterior. I feel like your work not only teases out our relationship to memory, space, architecture, but also gives the viewer an opportunity for self-awareness. BP: Yes—the 970 different photographic prints on paper poster became a physical reality in the urban landscape of Berlin. Despite its black and white appearance, people accepted it as a new reality. Some people walked by and said “Oh look— the Palace is back.” It shows how much our perception is already intertwined the physical, real-world reality and the mediated reality. I believe we live in an “augmented reality,” more than we sometimes notice. BETTINA POUSTTCHI (*1971, Mainz, Germany) lives and works in Berlin, and is known for her large scale photographic interventions and sculpture, exploring the connections between systems of time and space in a transnational perspective. She is represented by Buchmann Galerie in Berlin and Lugano, and has had previous solo exhibitions at Hirshhorm Museum and Sculpture Garden, Washington D.C.; The Phillips Collection, Washington D.C.; Nasher Sculpture Center, Dallas; Städtische Galerie, Wolfsburg; Schirn Kunsthalle, Frankfurt; and Kunsthalle, Basel. Her most recent exhibitions, Suspended Mies, is currently on view at The Arts Club, Chicago. Bettina Pousttchi: Suspended Mies runs at The Arts Club of Chicago through August 5, 2017. May 23, 2017 | Filed under Art Seen: International, PAST ISSUES and tagged with Bettina Pousttchi, Caroline Picard, The Arts Club of Chicago.